The DTS4050 Digital Thermocouple Scanner is ideal for use in turbine engine, diesel engine, and compressor test cells, as well as other industrial environments such as boiler and oven temperature monitoring. The module has a stainless steel enclosure with a lid for input terminal access. The standard DTS is insulated, rugged, and splash resistant. Also included as standard are environmental shock mounts. 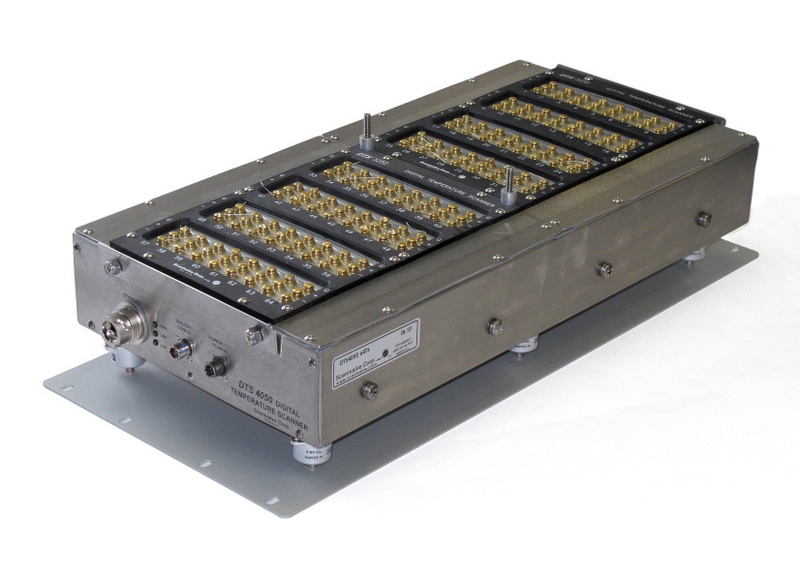 The DTS4050’s electronics were specifically designed to endure punishing high EMI noise environments while still being able to provide accurate engineering data. This allows the DTS4050 Intelligent Scanner to be mounted in close proximity to the test article, thus minimizing thermocouple wire lengths. Shorter thermocouple wires not only reduce errors, but also lower costs due to the elimination of extension cables. Field calibrations can be used to modify coefficients which can also improve end to end accuracy. The standard DTS4050 module accepts two wire or three wire shielded thermocouples. Legacy CompatibilityThe DTS4050 replaces the model DTS3250. Its software is backward compatible to existing DTS data systems; therefore, DTS3250 and DTS4050 modules can operate on the same network, and communicate with the same controlling software.Model DTS4050/64Tx, Digital Temperature Scanner, accepts 64 thermocouple inputs. It incorporates RAM, Integral Low Pass Filters, 22 bit A/D converters, and a microprocessor, in a rugged stand alone module. An isothermal block is incorporated for the Uniform Temperature Reference (UTR) for each 64 channel input. NIST thermocouple tables for standard thermocouple types are stored in flash memory. The microprocessor uses these look-up tables to convert mV inputs to Engineering Units. Temperature data are output in °C, °F, °R, K, millivolts and counts.The DTS4050 accuracy for types E, J, K, N, and T is ± .25°C to ±2.0°C depending on the thermocouple type and the useful temperature range. Multiple standard thermocouple types may be used with one intelligent thermocouple scanner, Model DTS4050.